Walking to school over the snow muffled cobbles. Karou had no sinister premonition about the day. It seemed like just another Monday, innocent but for its essential Mondayness, not to mention its Januaryness. It was cold, and it was dark - in the dead of winter the sun didn't rise until eight- but it was lovely. The falling snow and the early hour conspired to paint Prague ghostly, like a tintype photograph, all silver and haze. Meet Karou. She fills her sketchbooks with monsters that may or may not be real; she's prone to disappearing on mysterious "errands"; she speaks many languages—not all of them human; and her bright blue hair actually grows out of her head that color. Who is she? That is the question that haunts her, and she's about to find out. The opening sentences of the book were descriptive and hypnotic, as the melody of the words transported me to the snowy sights of Geneva. The author's attention to detail is extremely thorough. Her use of imagery evoked a sensory journey into a world we believe to be similar to ours. I was smitten from page one. THAT DID NOT JUST HAPPEN! I DID NOT SEE THAT COMING! You don't believe me do you? Just trust me on this one. Once you learn more about Brimstone and what is hiding behind the door, you will answer your questions over Brimstone and his incessant need for teeth! The way the author writes has me reminiscent of a Charles De Lint book I once read. The way her characters can tread from one world to the next with ease. Laini Taylor makes fantasy believable. 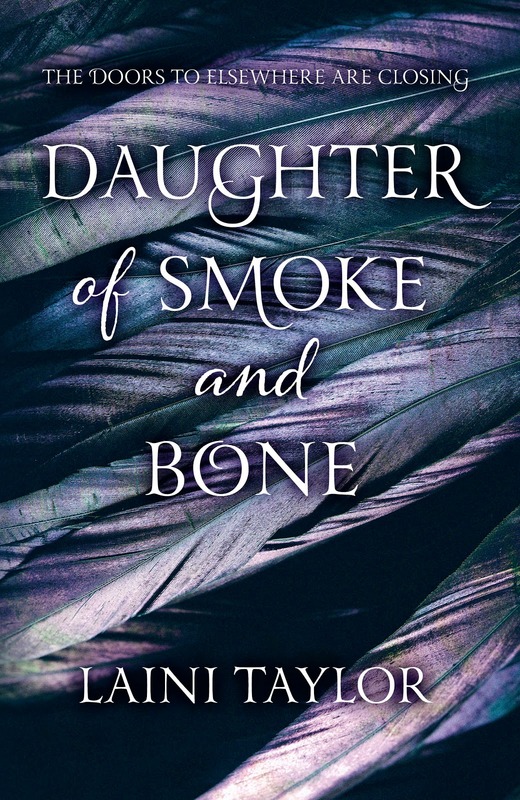 This book is full of changing relationships where you struggle to work out whether Karou's family and friends are good or bad for her. Each character has a dual dimension and you are not sure if their actions are for the greater good or evil. There is an element of Romeo and Juliet to the book, which pulls the whole story together. My favourite character has to be Kishmish. Oh how I cried! Karou is a sassy little lady, who looks all sweetness and light, yet can get you in a headlock in seconds. She is not to be messed with. She is clever and determined, not stopping at anything until she finds out how to reach the only family she has ever known. I am struggling to not tell you anything about this book, because you really have to read it. It isn't like any book I have read in ages. So much of it, is so unexpected, leaving you wondering what will happen in the next book. Just go read it and come back and talk to me when you have finished! I cannot wait to get my hands on this book. I totally believe you about how good it is and I'm already excited about it. Great review! LOL. I love books that surprise me like that. This one sounds like a must read! Well if you loved it then I guess I better read it ASAP. Your review makes me want to read this one Viv. And such a pretty cover too. Wonderful, enthusiastic review, Vivienne! It amazes me how many books you read and review. And so many of them sound fantastic, like this one! I loved Kishmish as well! Aah, the heartbreak is back now. Excellent review! This is one I still need to read but I've put it off. Too many positive reviews make me wary I'll admit but I'm glad you enjoyed it!